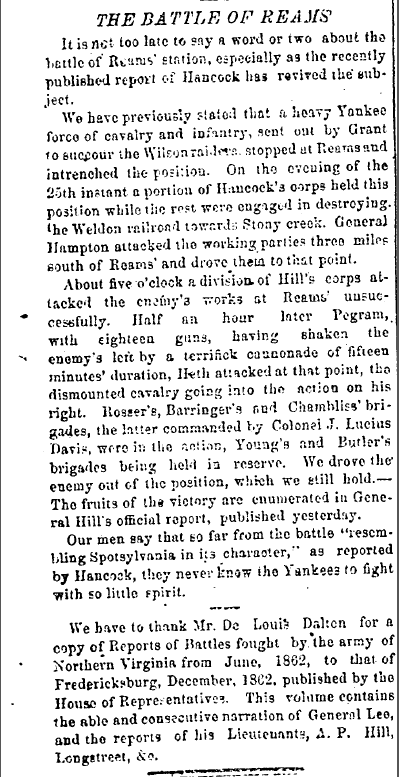 It is not too late to say a word or two about the battle of Reams’ station, especially as the recently published report of [Winfield Scott] Hancock has revived the subject1. We have previously stated that a heavy Yankee force of cavalry and infantry, sent out by Grant to succor the Wilson raiders stopped at Reams and intrenched the position. On the evening of the 25th instant a portion of Hancock’s corps held this position while the rest were engaged in destroying the Weldon railroad towards Stony creek. General Hampton attacked the working parties three miles south of Reams’ and drove them to that point. About five o’clock a division of Hill’s corps attacked the enemy’s works at Reams’ unsuccessfully. Half an hour later [William] Pegram, with eighteen guns, having shaken the enemy’s left by a terrifick cannonade of fifteen minutes’ duration, [Henry] Heth attacked at that point, the dismounted cavalry going into the action on his right. Rosser’s, Barringer’s and Chambliss’ brigades, the latter commanded by Colonel J. Lucius Davis, were in the action, Young’s and Butler’s brigades being held in reserve. We drove the enemy out of the position, which we still hold.—The fruits of the victory are enumerated in General [A. P.] Hill’s official report, published yesterday.